Pablo was born in a little Argentinian town where he always had close contact with nature and developed a strong interest in sustainability. At the tender age of 8, he created an environmentalist group with his elementary school friends. His curiosity and restlessness have led him to engage in several activities ranging from Aboriginal Culture to Model Flying Lessons. 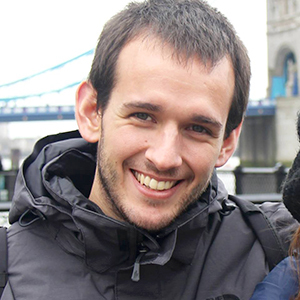 He is an Audiovisual Communicator, and he has worked for film and advertising agencies and also as a freelancer. Pablo has a Postgraduate Diploma in Cultural Management. He set up the communications area at TierraVida, a non­profit start­-up, and later became their Operations Director. Through this role, he coordinated local and international youth leadership programs focused on environmental education. He also worked as a specialist in social responsibility and sustainability at the headquarters of an international company with a presence in seven Latin American countries, training leaders of social impact projects. Wherever he goes, Pablo practices and promotes positive communication by focusing on creative and collaborative solutions to go beyond mere problem identification. He hopes that through the Social Innovation Management program, he can keep growing and discovering new outlooks on the world.